Assassin's Creed needs no introduction, because despite the number on the box, this is the fifth major instalment in the historical open-world action stealth series. The series jumps forward, once again, as we're transported in time and space from middle ages Europe to revolutionary America. For the first time, players can experience the action on the current generation of consoles. This is the first major break in the series narrative, and while the mission-based structure of the game is retained, the "Animus" characters and environment are all new. The main protagonist of AC3 is a half Native American, half English man born Ratonhnhakéton, who goes by the English name of Connor Kenway. Connor's real-world modern counterpart is still Desmond Miles, who has been a constant part of the AC series. Continuing a trend that began in the last AC title, AC3 features more playable sections featuring Desmond. As has been the recurring theme of the series, the Templar/Assassin conflict is the subtext that is being played out both in the modern world as Desmond, and in-game as Connor. As one would expect from the later timeframe, firearms feature more heavily in the game this time. But in line with the North American location, hunting bows and the Tomahawk also take their place in Connor's armoury alongside the traditional hidden blade. Unlike the two games before it, which were essentially very extensive level and mission packs for Assassin's Creed 2, this game was built from the ground up and was in development for three years alongside the previous two games. As a result, it saw a host of new capabilities as well as a host of new environments. The player can brandish and use two weapons simultaneously, and in keeping with the game's location and time period, hunting plays an important part in the action. But it is the American revolutionary war that gives the game its main drama and drives the narrative. Connor inhabits the world of and interacts with characters such as George Washington, Benjamin Franklin, Thomas Jefferson, and Paul Revere while travelling between his native Mohawk village, the colonial frontier, Boston and New York. The Eastern seaboard will also be a theatre of conflict, and Connor can captain a ship and take part in naval combat. Connor does battle with the forces of evil as a member of the Assassin's brotherhood. The game has been graphically remastered and features higher resolution textures, a new graphics engine and 4K support if you're playing on a higher end console. 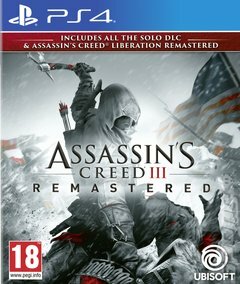 It also packs in all the content ever released for the game, including the single-player missions Benedict Arnold and Hidden Secrets, The Tyranny of King Washington and Assassin s Creed III: Liberation Remastered. That's a lot of assassination for one game!